This is a massive study, what the author calls 'a topic for a biography' (x). It occupied four years of his time, during which he obviously saturated himself in his subject, her period, her circle, her letters and all the contiguous material requisite for a full investigation. The result in the mass is curiously unsatisfactory. To adapt Henry James's celebrated dictum on Middlemarch, this is not a treasure house of detail but it is an indifferent whole. Undigested and indigestible, it reminds me of the Empress Messalina's infamous innuendo (according to Juvenal) that after a night spent in the brothels of Rome she withdrew wearied but not satiated. 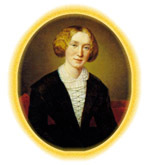 In a modestly intellectual way I was wearied and satiated but not satisfied when I reached the haven of Appendix A of George Eliot: A Biography, and this despite the fact that the narrative generally follows a convincing, reasoned chronological line. Perhaps the inbuilt departures from it are too indulgent, as when Professor Karl draws an analogy between the relationship of Jean-Paul Sartre and Simone de Beauvoir with that of George Henry Lewes and George Eliot. Lewes, we are told, played 'Beauvoir to her Sartre' - 'Like Beauvoir, he was "on call," and while there was reciprocity - more than that between the French couple - the balance definitely tipped towards Eliot' (538).